Beyond thrusting 3D printing back into the media limelight, Carbon3D’s sudden emergence is illustrative of a number of forces at play within the additive manufacturing / 3D printing industry. To really understand these forces (and their ramifications) requires a look at the technology and science behind Carbon3D. Just like most things, the devil is in the details – without understanding Carbon3D’s core technology, it is easy to jump to some pretty misguided conclusions. Fortunately, because Carbon3D published an academic paper focusing on the core technology, we are afforded the type of in-depth look that we are rarely privy to for a startup company. First, it’s very important to recognize that CLIP is a not a new printing technology unto itself. Rather, it is an extension of stereolithography (sometimes abbreviated: SLA), which has been around since the mid-1980s and was commercialized by 3D Systems. 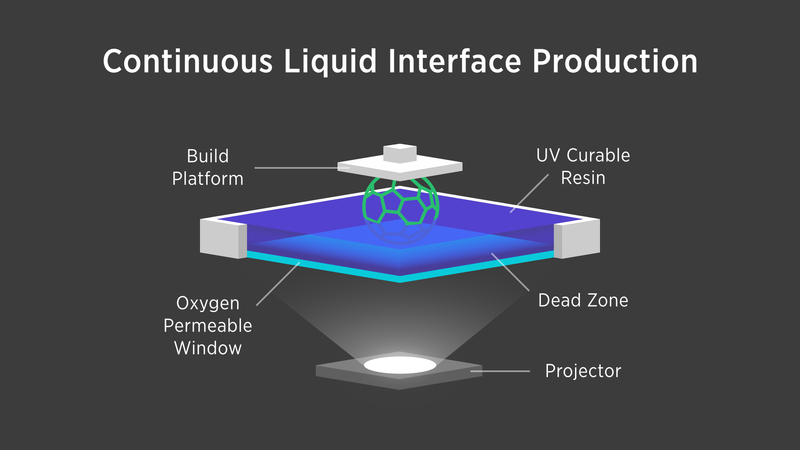 As the original patents on stereolithography expired over the last ten years, new entrants have entered the printer market (for example FormLabs), attempting to extend the technology and make it more accessible to consumers. Stereolithography has always been a mainstay of rapid prototyping, offering accurate and detailed prints. The heart of the technique is the use of UV light (from a variety of sources, including sophisticated DLP projectors) to cure photo-resin. A digital model is converted to slices and then each slice is progressively projected on a thin layer of photo-resin. The exposure triggers a chemical curing of the resin, hardening it in place. The part is then mechanically lifted or dropped (depending on the method), allowing a new layer of resin to flow into position to be exposed. In this way, a 3D part is built layer by layer. While these layers can be made to very fine tolerances (20-40 microns), the overall process suffers in terms of speed, due to the inherent stepwise nature of the build process. Carbon3D has created a technique (CLIP) whereby a part can be printed continuously, as opposed to stepwise construction, greatly increasing the speed of printing and eliminating some of the materials issues associated with stepwise growth. An inherent technical issue for stereolithography is that any resin exposed to UV light will cure. Thus, projecting one thin layer on the top of a vat of resin will not simply cure just the surface, but also the resin below (as far as the light penetrates). For that reason, using traditional stereolithography, only a thin layer (corresponding to the layer thickness in the digital file) is allowed in the exposure area. Resin tends to be viscous and slow moving, thus physically moving the resin into the exposure zone is not instantaneous and, depending on the build volume, can limit the speed of the overall process. Scientists at Carbon3D have developed CLIP to allow a reservoir of unexposed resin to reside immediately below the exposing resin, such that when the active resin has been cured (and the part moved), unexposed resin can flow immediately into the active area (a much shorter path, compared to traditional methods). The trick is to make resin in the “Dead Zone” immune to UV curing. Scientists at Carbon3D have accomplished this by using dissolved oxygen. The CLIP technique utilizes an oxygen permeable membrane. This membrane (or window) allows oxygen from the air to dissolve into the resin located directed below the active area, creating the “Dead Zone” effect. Resin in this area cannot be cured due to the presence of oxygen. However, when the layer of resin above the Dead Zone cures, the part is raised and uncured resin wicks up, out of the oxygen-rich zone. Once the resin leaves the Dead Zone it begins to cure. Carbon3D’s printer allows this process to occur in a (near) continuous fashion, such that the build rate is effectively limited by the curing time of the resin. This is an improvement on traditional stereolithography techniques that can be limited by resin flow (from more distant reservoirs, as in the case of traditional stereolithography techniques). This process allows parts to be made in minutes, as opposed to hours, achieving a (reported) 25-100x improvement on build speed. Carbon3D also claims that this process allows for production of stronger materials and parts, because growth is occurring continuously rather than in discrete layers. This achieves more uniform material properties, whereas previous techniques may have strength issues between layers (in the z-direction or growth direction) due to the stratified growth. Stereolithography has been the mainstay of rapid prototyping for years for the quality of parts that the method produces. It is capable of printing with tremendous detail and relatively good surface finish (especially when compared to FDM/FFF, the extrusion process that is at the heart of most consumer/desktop printers). CLIP is pushing these already impressive limits, but Carbon3D’s founders have set their sights beyond prototyping and see their technology as a solution for final part production. How realistic is that? When we look at stereolithography using the lens of final part production, the conversation is very different from prototyping and issues emerge. Photo-resins are not generally used for final part production as generally they lack the mechanical properties and durability to make them suitable for commercial products. While stereolithography is ideal for prototyping, other 3D printing processes are more commonly used to make final products. These techniques allow for the printing of thermoplastic materials such as ABS, which is known for its light weight coupled with impressive mechanical properties such as impact resistance and toughness. In comparison to CLIP (as well as other stereolithography techniques), the other major competing desktop/consumer 3D printing process, FDM/FFF, suffers from significantly slower speeds, low levels of detail and surface finish and weakness between growth layers. That said, FDM/FFF does offer access to a richer materials palette, to include commonly used plastics such as ABS and polycarbonate. This is extremely important, as thermoplastic materials have become the backbone of consumer electronics, due a combination of cheap price, light weight, impressive mechanical properties and manufacturability (for example, high volume processes like injection molding). Have a look at most consumer electronics, such as your remote control or your vacuum cleaner, and you will see some nice examples of strong, rugged thermoplastics made via injection molding processes. That said, there has been significant progress developing new photopolymer resins for use with stereolithography in recent years. The emergence of PEEK and ceramic resins offer options for final part production (especially for biomedical applications), but the performance of these materials using stereolithography in many cases lags other 3D printing techniques, such as SLS. Furthermore, adapting the CLIP technique to different resin chemistries will present Carbon3D with a variety of non-trivial challenges. Oxygen diffusion is likely to be different in each resin, affecting the dynamics of the Dead Zone. Depending on the magnitude of this variance, the performance and speed of the printer will be affected, requiring the system to be calibrated for each resin (or else print quality will suffer). In particular, the aforementioned PEEK and ceramic resins are significantly more viscous than normal photopolymer resins, creating challenges for integration into the print technology. And this is the main obstacle facing Carbon3D. While dramatically increasing the speed of 3D printing is huge cause for celebration, a printer is only as good as the materials it prints. Extending the technique to more useful materials will be difficult, but success in this pursuit will be truly game changing. While there are undeniable challenges presented by the limitations in materials available to stereolithography techniques, Carbon3D has the perfect script to extend their story of innovation, which illustrates why we should care about 3D printing and its relation to open innovation. Because of the current interest in 3D printing coupled with active open-source communities, university research and expiring patents, we are seeing a tremendous uptick in innovation from printing technologies that are over 20 years old. This is an incredibly interesting turn of events, which is making many observers question the true value of intellectual property protection and the value that patents represent (or restrict). In other arenas, Tesla is challenging conventional wisdom regarding IP protection. Tesla has released a number of patents, such that others can iterate on top of them. The hope is that outside companies and entrepreneurs can innovate and create a more robust ecosystem by which Tesla will eventually reap rewards. Traditional economic wisdom says that end customers will benefit from such an approach, but it remains an open question whether companies such as Tesla will also profit from the strategy (not to mention investors). Returning to 3D printing, some experts are wondering whether the patent-heavy landscape of 3D printing is actually holding it back. Would innovations such as CLIP have come about sooner in the absence of strong and lengthy patent protection? How many other innovations are being held back (waiting for patents to expire) that could push 3D printing to broader adoption? These are questions being asked across a number of industries and their implications on technology investing are profound. For now, the innovation space surrounding stereolithography (and FDM/FFF) is proving an important case study. The story of Carbon3D is one that investors have been eager for. That enthusiasm has been reflected in an impressive succession of funding rounds, the latest of which was announced today by Autodesk’s Spark Investment Fund. Autodesk’s $10 million investment makes a great deal of sense for both parties. The Spark Fund was set up to support ventures that mature 3D printing, bringing new ideas into the marketplace that could benefit Autodesk’s positioning in 3D printing software, specifically the Spark Platform. If Carbon3D develops the printing platform that drives 3D printing into mainstream consumer use, Autodesk will want their software to be the interface that users rely on to make their designs come to life. By committing 10% of the fund’s total capital to Carbon3D, Autodesk is making a significant bet that Carbon3D will emerge to join a number of incumbent 3D printing companies who are major players in the market. For Carbon3D, having a trusted partner in software is key to accessing mainstream users. As I’ve discussed in previous posts, a barrier to the adoption of printing platforms is usability. Carbon3D must be careful to pair their printing innovation with a comparably innovative interface (software). Without a doubt, the company has already added (and will continue to recruit) top programming talent, but the origin of the company’s technical expertise comes from chemical engineering. By adding Autodesk’s 3D printing software expertise, Carbon3D has gained an important advantage, especially over competing startups. The hope is that when Carbon3D launches their printing platform (sometime in the next year), their innovation in user-interface will match the work that has already been accomplished with CLIP. Looking back at previous investment rounds, Carbon3D has already shown itself to be a force to be reckoned with, raising $41 million (it is unclear at this time whether the investment by Autodesk is included or in addition to this previously released figure) in less than 18 months. (These numbers imply a likely valuation exceeding $100 million.) Highlighting these financing rounds has been the backing of elite venture capital firm Sequoia Capital. With a storied history of backing some of the biggest tech companies, Sequoia’s involvement has many wondering if 3D printing is finally ready to make a large leap. Joining Sequoia are Series A (December 31, 2013) investors Piedmont Capital Partners, LLC and the Wakefield Group and Series B (Dec 31, 2014) investors Northgate Capital Group, Silver Lake, and Silver Lake Kraftwerk. With the development of their CLIP technique, Carbon3D has shown that the expiration of patents provides opportunity for rapid and significant innovation. Now, armed with world-class scientists, the backing of one of the world’s most successful venture capital firms and a newly-formed strategic relationship with Autodesk, they have the opportunity to push the envelope of 3D printing. They have already extended the capabilities of stereolithography, but to truly push the 3D printing world to the next level, they will have to translate that success into new materials with end-product functionality. Now that Carbon3D has emerged from the shadows, we’ll be watching. Headline photo is courtesy of Carbon3D’s media kit. Posted in Additive Manufacturing, Advanced Manufacturing, Feature Articles, Technologies and tagged 3D printing, Autodesk, Carbon3D, CLIP, expired patents, materials, Sequioa, Spark Fund, stereolithography, venture capital. Bookmark the permalink.